U.S. demand for illicit drugs creates markets for Mexican drug trafficking organizations (DTOs). This paper examines how marijuana legalization in California might influence DTO revenues and the violence in Mexico, focusing on gross revenues from export and distribution to wholesale markets near the southwestern U.S. border. The analysis described here is rooted in an earlier RAND Corporation study on marijuana legalization (Kilmer, Caulkins, Pacula, et al., 2010) and presents a method of estimatingthe revenues that international drug traffickers derive from U.S. sales that is transparent and, hence, auditable and replicable. We believe that this method can be iteratively improved by research over time, whereas existing methods that rely heavilyon classified information have not been subject to review and have not shown much ongoing improvement. Five technical appendixes include additional information about the weight of a marijuana joint, THC content of sinsemilla and commercial-grade marijuana, marijuana prices, Mexican DTO revenues from drugs other than marijuana, and the availability of Mexican marijuana in the U.S. 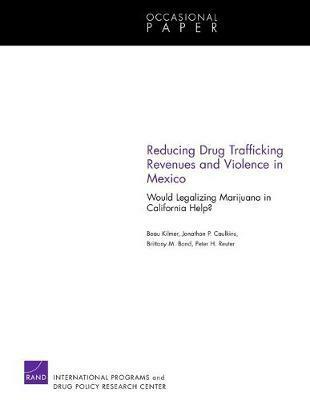 This paper examines how marijuana legalization in California might influence drug-trafficking organizations' revenues and violence in Mexico.